In pursuit of a full tummy of his new found favourite food, Costco’s frozen Meatballs; a black bear that was spotted in Glendale, California captivated the public becoming quite the local celebrity. Aptly referred to as “Meatball”, the bear found his way back to the township after being returned home to the Angeles National Forrest on two occasions. An official of the Californian Department of Fish and Game, Andrew Hughan was a fan of the creature ever since he got the report that the bear was spotted rummaging through rubbish bins. “The bear just walked right in, popped the freezer door open, and about 2:30 in the morning, he was eating this large bag of meatballs”, he said. But resident’s concerns began to grow as Meatball’s visits became frequent, and out of fear for that he would be put down, local woman Sarah Aujero saw the opportunity to use his fame to help save his life. Starting a twitter campaign @theglendalebear Meatball’s supporters connected in from far and wide to ensure that he wasn’t euthanized… all 28, 700 (and counting) of them. 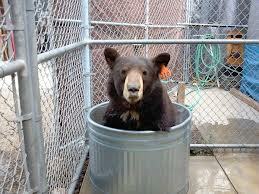 Using a McDonald’s Happy Meal, French fries, bacon and honey, Meatball was caught on his third trip to the town, and relocated to the Alpine Lions, Tigers and Bears Sanctuary. Founder of the sanctuary, Bobbi Brink says “it is heart-warming that people care about animals as much as we do. He is a very loved bear, a very special bear. He’s beautiful”. “He’s got a great sense of humour, he’s funny and smart and I can’t wait to get him out into the habitat because he wants out now”, he said. It has been confirmed that Meatball is now enjoying a varied diet, including grapes and peanut butter sandwiches.